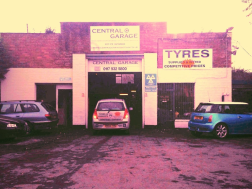 Central Garage is a family run garage and also is an MOT testing station, we have been in the motor trade for many years, so have lots of mechanical experience in order to deal with your repairs. We offer a wide range of services to both the trade and public at very competitive prices. Central Garage has great experience with all makes/models of cars so with our experience we can guarantee you a friendly and flexible service and with this in mind we also offer a free collection/delivery service within a 5 mile radius for your convenience.